… Several years ago, a local HS science teacher with a Ph.D., was introduced to me and I was told that he had a device that would sit on top of the roof of a home, and produce energy free for 25 years. That went in one ear and out the other, then he produced a letter from the head of the physics department of a highly regarded engineering school validating the statement. I phone the professor and made it a point to visit him personally. He validated the statement by saying that the lab prototype did indeed prove itself. Carlos Avila Rivera, right, describes his device. # Honors : Nominated for Nobel Prize – “Mr. 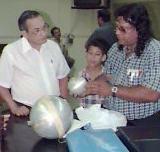 Avila teaches science in a high school at Utuado, Puerto Rico.A religious man, he believes that the universe to be a gigantic whirlpool–rotating and being sucked into a gigantic black hole in its center. The news story also mentioned technical innovations, that could be applied to all sorts of home appliances.”According to Univision; channel 11, San Juan, Puerto Rico; Feb 3, 2003.